My bees seem to be finding water somewhere else because they have not been frequenting my little pond that I set up for them some time ago. It has water lily and hyacinth growing in it. 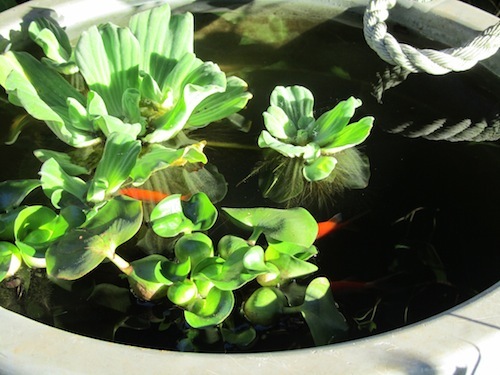 There are 5 goldfish to eat any potential mosquito larva. And the whole thing made it through the winter in it’s 40 gallon bucket. Well, it was way out of their flightpath and we just moved it over closer to the hive. The fish seem to like it and the plants will most certainly grow flowers there with more light. Now it’s just a matter of time before the bees discover it too. 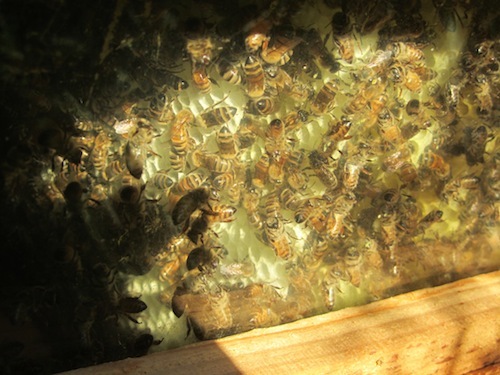 I do prefer the idea of them drinking water, which they use in honey curing, from a source that I can control then from someone else’s yard; particularly as it gets to be dry season around here. Other than that these bees are doing really well. I see them flying around the neighborhood visiting a variety of flowers and blackberries. 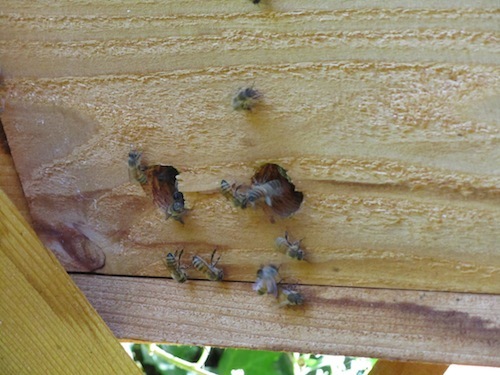 They come home laden with pollen and jam themselves in and out the doors. I opened up two more doors for them recently, since they have filled the hive over half way with comb. 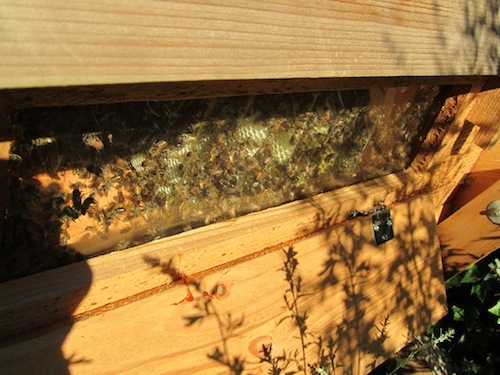 Here are some pictures of their hard work through the viewing window on the West side of the hive. If they keep up the work like this they should have their ten combs and more, to make it through the winter on. They’ve sealed up all the cracks around the window with propolis. There is a big red drop of it on the middle of the door. I scooped some up and put it on a canker sore. That made it feel much better, and my teeth super yellow and sticky. Here you can see them building new, white comb and rushing about the hive doing their important bee business.